This month's challenge from ol' P.J. is black and white. I took him literally and so all my photos this week are black and white. I'm used to colour photographs so this month's collection was a bit of an eye opener for me. 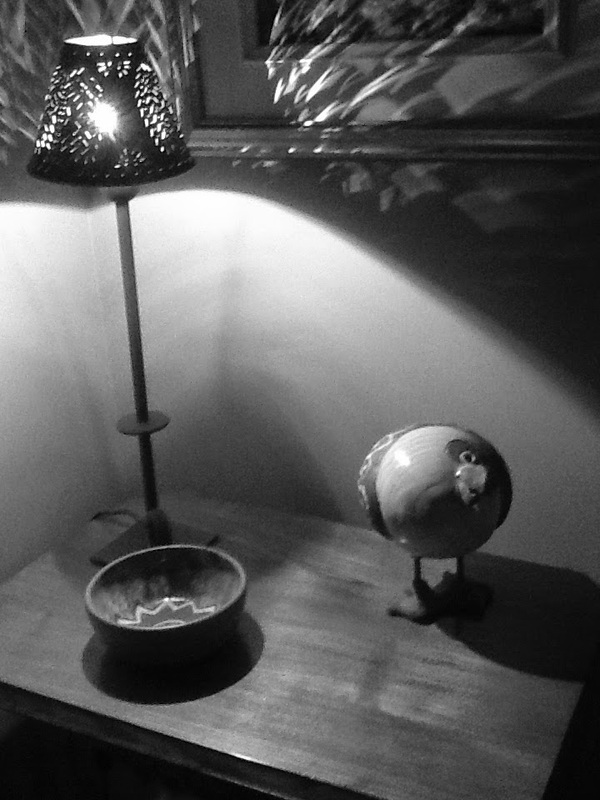 That round thing on the table is a ceramic puffin we picked up at a gift shop in Ogunquit, Maine a few years ago. But what I like about this picture is how the light shines through the metal shade onto the wall behind. These are flowers on our kitchen table. I was having lunch and doing a crossword when I thought these white flowers might satisfy this week's prompt. I'd been passing by this place for weeks but could never find a place to stop and park so I could get out and take a few pictures. I was really quite taken by this dilapidated barn. 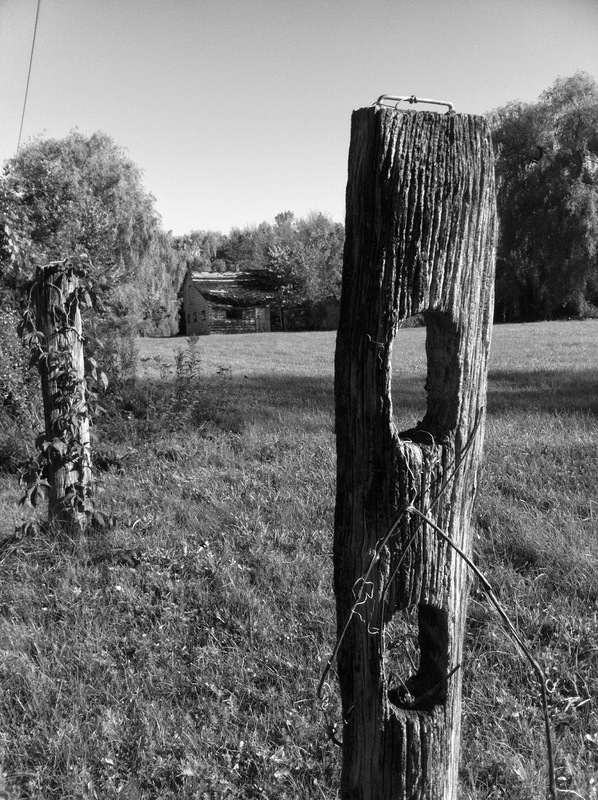 But as I approached it I came across a fence post that I included in my shot. Here's the barn, which used to be white but it's now pretty aged by the weather. I had to park in the neighbour's driveway, get out of the car and walk into the field to get this shot. The neighbour came out and shouted "Hello". I said "I just want to take a picture of this barn. I'll only be sec." He was kind enough to let me park in his driveway. I felt a bit rushed and I didn't quite get as close as I wanted, though. This last photo was taken at a nearby cemetery. For some reason I had cemetery in my mind all month once I knew the prompt. There's just something "black" about one's final resting place. The neat thing about this picture, I thought, was how the sun dappled across the lawn and tombstones. The place was very peaceful. I was the only one there. That's my collection of pictures for September. Hit P.J. 's link, above, to see what the rest of the participants came up with this month. The whole light and shadow line thing going on in your first photograph is really interesting to me. As for the barn, love the leading lines created by the mowing. They make me want to walk right up and take a closer look at that old barn building. I like the field but I also really like the one with the fence post for some reason. Nice shots, Dufus. I really like the tones in the first one. Thanks, Mike. Good to see you around the interwebs again. I have enjoyed coming across a few old barns while hiking and taking pictures of them. I love the age... the rawness of them. That post is really beautiful. The CEMETERY is my FAVORITE. The shadows and sun... the age... really well done! I would have liked to have gotten closer to that barn but I was on private property and took a couple of quick pics and departed. Do you know how many people are dead in that cemetery? All of them! I agree with your assessment of your first shot in what you like. Those lights on the wall really help the shot a lot. Here's one, Paul that I discarded but it has more of that interesting shadow from the lamp. I had another shot that I tried to upload here unsuccessfully for some reason that better showed that interesting shadow. love, Love, LOVE the perspective and detail in the fencepost capture. Shooting in BW is always such an eye opener when you see the textures and details. Yeah, of the five here I think that's my favourite too. I like that fencepost one. I do a lot of photography like that and really enjoy the look, especially in black and white. Cemeteries are always good choices for black and white, too. Nice work!